This morning, Mary and I took a trip down to the Calumet site to see what was up with our favorite bridge pair. It was an absolutely gorgeous morning, but the sun was sitting just at the angle that it streamed through the bridge girders and made it impossible to pick out more than silhouettes. We spotted an adult bird in the sky about five minutes after we arrived. I set the Canon up on the tripod and popped the 2x extender on the 70-200mm. I don’t love the pictures I get with that combination, as they are a bit soft for my taste. However, since I knew these birds wouldn’t come down close, I had to live with it. The bird in the air finally landed on a beam about halfway across the bridge. Mary and I were pretty pumped to see it disappear inside. We hoped we’d see two adults emerge, or at least two distinct adult vocalizations from the inside, but sadly, the adult we’d seen go in, popped right back out about a minute later without making a sound. It took off to the east and disappeared. Mary and I decided to wait around to see if it would come back, hoping for a nest exchange. In the meantime, we spotted two Canada Geese swimming together in the river. Although they were both full adults and had nearly identical plumage, there were two striking differences. For one, one goose was about 40% smaller than the other. For two, the smaller goose had a very odd patch of pure white feathers on its head. Mary asked me to take a picture for the bird division, so I got a few pics. Be interesting to see what that’s about! Just as I finished taking pictures of the weird goose, the adult came back from the east with some prey. It landed on a cable near the top of the bridge and started eating, so I snapped many pictures, hoping I’d get some hint of a leg band. Mary was pretty sure she could see it was banded through the scope, so I was just hoping to confirm, maybe pull some color, since the lighting was making everything appear in shades of grey. The adult didn’t take any of the meal into the nest. 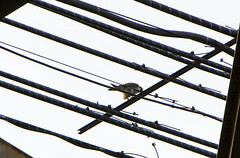 Rather, it finished up, wiped it’s beak on the cable and took off towards the east again. Sigh. Mary and I decided to pack it in and come back down another day. When I got back to the museum, I took a quick look at the photos. I did get more color and definition than I thought I had, but still not much. It was enough that it was clear the bird was banded. It also looked like the bottom band just might be red, but then again, that could have been the morning sun casting a reflection. So, what do we know? A banded peregrine is hanging around by the bridge — not bad, but we’ll hope for more later. After work, I walked home so that I could take a look at the South Loop territory. I had been seeing two peregrines with some frequency in the past few weeks and I was hoping to track down exactly where they might be nesting. I spotted two in the air from a bridge over the train tracks and watched one of them land on the top of a nearby building. It sat for a moment and then waddled towards the interior side of the edge and popped down and out of sight. Wow! I stayed for about a half hour and the bird never reappeared. That certainly seems like nesting, but we’ll have to see! ~ by Steph on April 1, 2010.